France 2’s weekly news magazine Envoyé Spécial had a remarkable half-hour reportage last night on Marine Le Pen’s vote in rural/small town France (watch it here; alternatively, here). 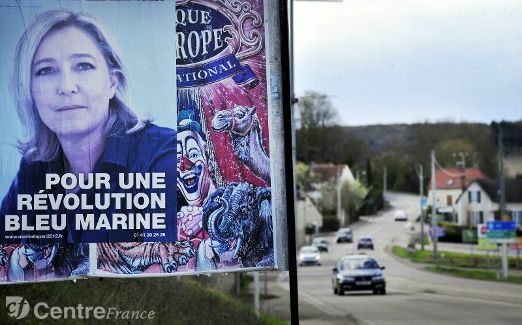 The report was from the department of the Loiret—which begins some 100 km south of Paris—, in the zones périurbaines (the exurbs) that have been much written about of late as a growing pool of votes for the Front National. The emergence of an exurban/rural FN vote was, to my knowledge, first written about in the 2003 book Mon village à l’heure Le Pen, by Christian Duplan, but the media has only begun to pick up on the phenomenon during this current campaign (see, e.g., the headline dossier in the February 28th Le Monde here and here, and the front page dossier in the April 28th Libération here, here, here, and here; and even in today’s Le Monde here). Some of these périurbain FN voters are farmers and villagers du cru but the bulk are urban exiles who have bought homes in the lotissements (subdivisions of identical-looking houses, e.g. 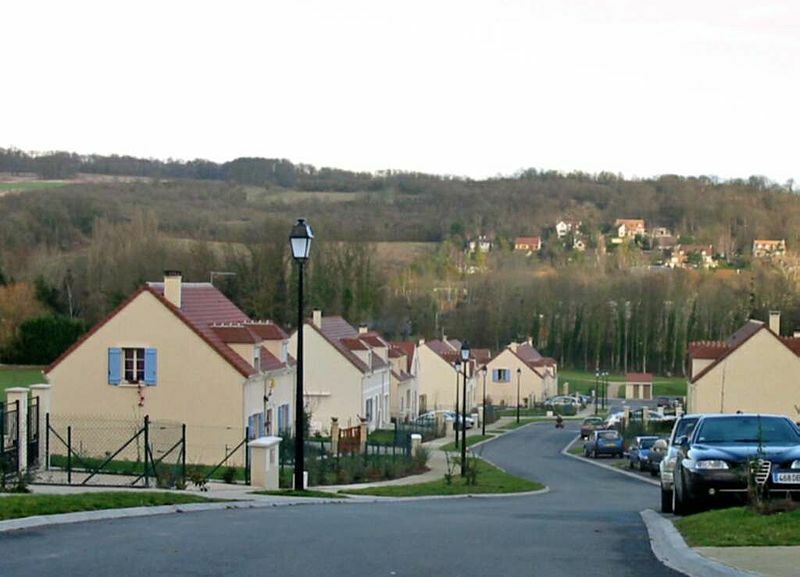 photo below) that have sprouted up in exurban France over the past decade, turning villages into bedroom commuter towns. Flying into Paris the other day and looking down over lower Picardy and the upper Ile-de-France, I was amazed at the number of lotissements on the edge of villages, which I had never noticed before. The physiognomy of a part of once rural France has been transformed over the past decade. The urban exiles have moved to these places not only because the houses are cheaper but also to escape the problems of the banlieues. “White flight” as it was called in the US. I had been making the argument since the ’90s that one of the factors explaining the high FN vote in the banlieues was the inability of many Français de souche living in close proximity to immigrant communities from the African continent to move out of those areas, either because they couldn’t afford to leave or were unable to sell their homes. A part of the FN vote could be explained by the functioning of the French housing market. Things have clearly evolved, but it hasn’t caused the FN vote to drop. The Envoyé Spécial reporter interviewed Marine Le Pen voters in rural Loiret communes where her scores on April 22nd were upwards of 30%. The reasons the voters gave for their choice: insécurité (fear of crime), a feeling of abandonment by the state—of declining public services, including the police—, a rage against “l’assistanat“—in American parlance: of welfare cases and freeloaders living off the public trough paid for by hard-working taxpayers—, a patriotic/nationalist rejection of globalization and the European Union—despite the fact that the kvetching farmers have benefited hugely from the EU’s CAP and that everyone benefits from cheaper imports—, a sentiment that they are working harder but making less (on travaille plus mais gagne moins), and a general fed up-ness with the political class—of both the right and left—that has been running the country forever… Mutatis mutandis these are French Tea Party Republicans. Professionally they’re commerçants, artisans, small businessmen, young skilled and semi-skilled workers in small enterprises, farmers, and even the unemployed dependent on the food bank at the local Resto du cœur (but who are seeking work and sharply differentiate their situation from those on l’assistanat). Many of these périurbains frontistes are barely living within their means—and totally dependent on their cars they’re being massacred by the price of gas at the pump ($8/gallon)—but not all are doing too badly, such as the mid 20s couple interviewed in the report, whose combined net income is close to €100,000 a year (but who consider themselves to be of the classe moyenne). Their reason for voting for Marine LP: they like her discourse on la crise, she says what she thinks—she’s a breath of fresh air and different from what they’re used to from politicians—, she’s not like her father—for whom they would have never voted; Marine is softer (plus lisse) and less virulent than he—, and they’ve had enough of paying taxes for those on assistanat. High taxes are an issue for these voters but there is no anti-state rhetoric. They want the state to work for them as hard-working taxpayers, not to support les assistés who don’t want to work (or whom they perceive as not wanting to work). Again, Tea Partiers all the way. Immigration is an important issue for the voters in the reportage but mainly as it is linked to crime and assistanat. It’s a complex issue with them. One of the Marine-voting families interviewed had a mid 20s unemployed Congolese sister-in-law, who was present in the interview. She sympathized with much of Marine’s rhetoric, though feared the FN position on immigration. The family’s response: as she’s actively looking for work and is clearly integrated into French society, she has nothing to worry about. She is not them. On insecurity and crime, the mayor of one of the villages said that there was in fact very little of it—an occasional burglary here and there—and few immigrants in the area, but that people were afraid of what could happen in the future. During the 2002 presidential campaign, when President Chirac made insécurité an issue—and facilitated J-M Le Pen’s accession to the second round—, I became convinced that the fear of crime by rural people and the elderly was linked to the transformation of television news in France, which went from focusing on politics and international affairs to reporting on faits divers. Beginning in the 1990s the JT de 20h came to increasingly resemble the crime report on the 10 o’clock news in some American city (okay, I’m exaggerating just a little but one gets the idea). E.g. when kids in a Strasbourg cité torched some cars or threw projectiles at police in Villiers-le-Bel, paysans and retraités in Trifouilly-les-Oies in the Indre-et-Loire would see it on the evening news and get scared. And vote Le Pen. One noteworthy comment by the mayor of a rural commune in the report: he didn’t know the voters who live in the lotissement. He hadn’t met them. The newcomers don’t mix (les gens ne se fréquentent pas). The sociologist and FN expert Jean Viard made the same observation in an op-ed in Libé the other day. Exurbanites don’t want to know their neighbors. Communities are not being constituted. Politically speaking these FN voters are not fachos. They are not permanently lost to the FN. A non-demagogic UMP could win many of them over. Even the PS could address many of their concerns and make a play for their votes (but the Front de Gauche will have no chance whatever, not even with the ouvriers among them). Watch the whole report. It’s worth it. Thanks. I know about the book and am pretty sure I’ve read an article or two by the author. Will take a look at it.